Cougar has been the #1 selling RV in its class for 13 straight years and it’s obvious why. 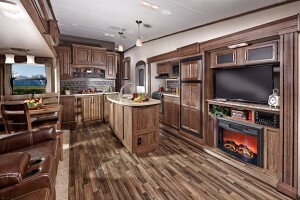 These RVs are made with the utmost attention to detail, high quality materials, and are offered in a wide range of floorplans that can suit almost any lifestyle. 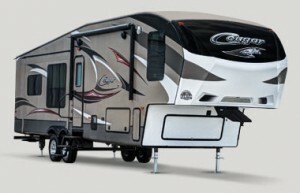 The 2015 Cougar 303RLS is one of many floorplans that is perfect for couples and small families. It can sleep up to 5 people and includes 3 slides. If you’re interested in learning more about the 303RLS read our review. Located at the front of the RV, this bedroom offers a plush queen sized bed in a slide that expands your living space. Along the front wall there is a huge full height wardrobe that features washer/dryer prep and a nightstand for additional storage space. Across from the bed you will find a dresser. There’s also a separate entrance to the bathroom. Located adjacent to the bedroom, this side aisle bathroom is spacious and luxurious. It features a neo-angle shower, vanity with a medicine cabinet, and toilet. There’s also a linen closet to store your extra towels. Situated at the rear of the RV, this living room is well equipped for relaxing after a long day out and hosting get togethers with friends and family. Along the back wall there is a sofa with a hide-a-bed and overhead cabinetry for storage.One slide holds two plush chairs (optional theater seating) and a large dinette. Across from this slide is an additional slide that includes the entertainment center. Spacious and high end, this large kitchen is the perfect place to get creative. It includes a large island with double sinks. This is a great space to prep food. One slide includes the refrigerator, overhead cabinetry and a three burner range. Along the wall that separates the bathroom from the kitchen there’s a huge pantry where you can store canned good, cereal, spices and anything else you might need room for. If you’re interested in learning more about the Cougar 303RLS contact us or view our selection online. We can answer your questions and ensure you have the information needed to make the right buying decision.